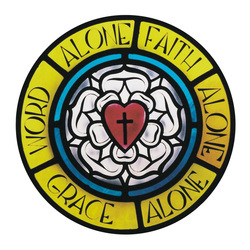 Lutherans are open about what we believe and confess. Lutherans are ready and willing to show that it is what the Bible teaches and what the ancient Church confessed. The following summary reveals where God’s Word establishes our teaching and includes links where you can find the historic and official Lutheran confession of this truth. *The only true God is the triune God—Father, Son, and Holy Spirit. *Every human being is conceived and born dead to God, is entirely predisposed to sin, is inherently without fear, love, or trust in God, and is lacking in the ability or will to turn toward God. Being entirely turned against God, each one is, therefore, under the sentence of eternal death and damnation. *Jesus Christ is true God, eternally begotten of the Father, and at the same time true man, born of the Virgin Mary. He is the only Savior from sin and the only Mediator between God and humanity (John 1:1–3,14; 1 Timothy 2:5; 1 John 5:20; Acts 4:12), who: …by His perfect life and sacrificial death on the cross, has won the entire forgiveness of sins and eternal life for every human being, from the beginning to the end of the world (Romans 3:21–26; Galatians 4:4–5; 2 Corinthians 5:21; 1 John 2:2); …rose bodily from the dead on the third day (1 Cor. 15:3–5); and…now reigns at the right hand of God as Lord over all (Eph. 4:10–12). *We are justified (declared ‘not guilty’) in the sight of God and rescued from sin, death, and damnation not by any works of our own, but solely by God’s undeserved kindness, His grace given as a free gift through faith in Jesus Christ, whose perfect life and sacrificial death as “the Lamb of God who takes away the sin of the world” fully atoned for our sins. *The blessings and benefits of Jesus’ saving death and resurrection (the forgiveness of sins, eternal life, and salvation) are offered, delivered, and applied to us by means of the Gospel in all its forms (the preached and written Word, Baptism, Absolution, Lord’s Supper), through which the Holy Spirit works faith in Christ. To this end Christ has instituted the Office of the Ministry and sends pastors to preach and administer the holy sacraments in His stead and name. *Good works, prayer, and holiness of life are the fruit of faith in Christ, not the cause of faith or salvation. *The Holy Church is present wherever the Holy Spirit gathers believers around Jesus Christ and His gifts, that is, wherever the Gospel of Jesus Christ is purely preached and taught, and Holy Baptism, Holy Absolution, and Holy Communion are administered according to Christ’s mandate and institution, even though unbelievers or hypocrites may also be numbered among those gathered. *Holy Baptism, which is water applied in the Name of the Triune God according to Jesus’ mandate and promise, works rebirth and renewal, delivers and applies the forgiveness of sins, joins the baptized to Jesus’ death and resurrection, and grants eternal life and salvation to all who believe the promise of salvation attached to Baptism. *Holy Absolution is the forgiveness of sins spoken by the pastor to a penitent sinner in Jesus’ name. Absolution actually offers, delivers, and applies the forgiveness of sins to the repentant person with the full authority of the crucified, risen, and reigning Christ, so that the word of forgiveness in Holy Absolution is to be heard not as the word of the pastor, but as Christ our dear Lord speaking to us Himself. *Holy Communion, or the Lord’s Supper, is what Jesus said it is: His true body and blood, given under bread and wine, for Christians to eat and drink, so that through them they have the forgiveness of their sins. *The Christian life is one of continual repentance and faith, from which flow good works as the fruit of faith. *Our Lord Jesus Christ will visibly appear on the Last Day to raise the bodies of all the dead, to condemn to hell and eternal punishment all those who reject Him in unbelief (together with the devil and his demons), and to give eternal life to all who trust in Him for forgiveness, life, and salvation. *Holy Scripture, or the Holy Bible, is the written Word of God. It is the very “breath of God” (inspired) and, therefore, without factual error (inerrant); it is the only source and final authority and judge of all teaching and teachers, of all practice and life (infallible). Holy Scripture preaches the saving death and resurrection of Jesus Christ for the repentance and faith of the sinner. *The Word of God is a two-fold word—the Law, which reveals our sin and seeks and kills the sinner, and the Gospel, which announces, offers, delivers, and applies the forgiveness of sins through the death and resurrection of Jesus Christ, creates faith in Him, and gives new life and identity to the believer in Christ. the Rev. Peter Mills of Grace Evangelical Lutheran Church of Akron, Ohio, who has nicely summarized these articles of the Christian faith and to the Rev. Eric Stefanski of Holy Trinity Evangelical-Lutheran Church, UAC, Harrison, AK, who added excellent biblical and confessional sources. Send a note to the pastor of Holy Cross Evangelical-Lutheran Church.